As you may have seen if you frequent my Instagram, I’ve been attempting to reconcile with my Polaroid camera, and Polaroid Originals film. The film was relaunched with some fanfare, after the Impossible Project acquired the rights to use the brand name. The old Polaroid company went bankrupt in 2008, and their instant films ceased production at that time. A private venture was founded to acquire the factory and recreate the film. It’s been a bumpy ride and the film has gone through several versions. My experience using it in a vintage 1980s Polaroid 635CL camera has been very mixed and verging on infuriating, enough to make me want to sell the camera at times. However, I thought I’d give it a last chance. I recently shot a black and white pack followed by a colour, and here’s some examples for you. I think we’re off to a good start here. This is a ruined bridge near Stow railway station in the Scottish Borders. It’s a favourite spot I’ve gravitated towards lots of times. First shot was blown out quite badly by the bright light, so I adjusted the Darken control and got this gem. Pics turn sepia after a while, and the film has a timeless quality I really like. Happy with this! This is the pier at Kilcreggan, in Argyll. I was just off the ferry from Gourock. 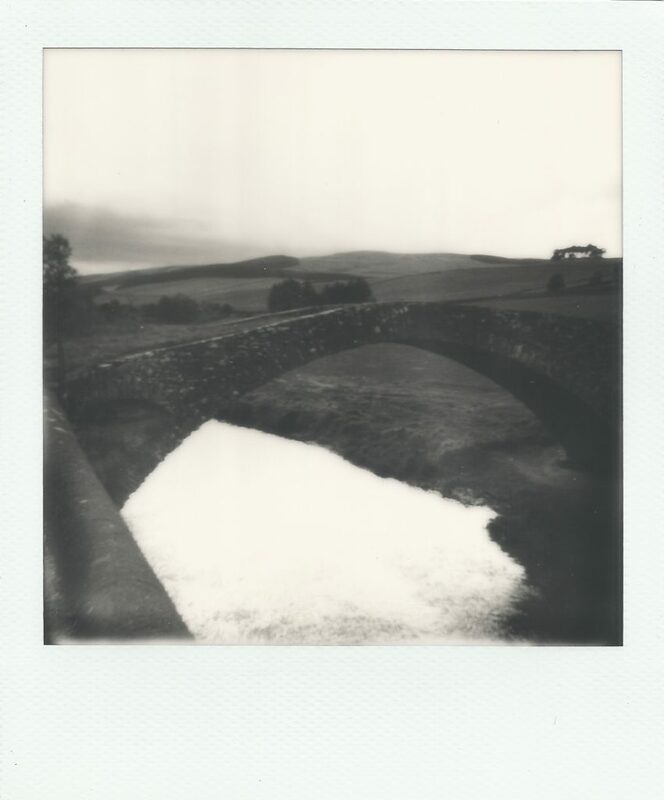 Much gloomier day than the bridge shot, but again, a lovely image that is moody and atmospheric, and just what I expect from a black and white Polaroid. Onto the colour, this was after schlepping up a hill in Garelochhead. 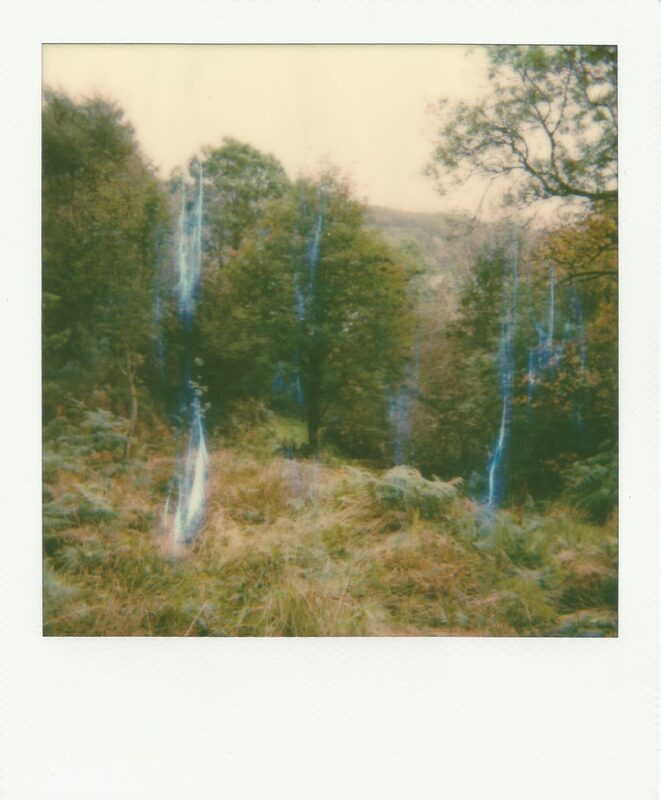 Massively annoyed by the very large blue streaks marring this image. I know imperfections are meant to be part of the charm, but this is a major development failure. Better than the last pack of colour I shot which almost completely failed, but this is just annoying and seems almost impossible to avoid. Plus the film takes an age to develop – not good. After researching the streaks, I attempted to find a solution. Apparently the opacity layer can be damaged by exposure to too much light when the pic emerges from the camera, and can cause the streaks. 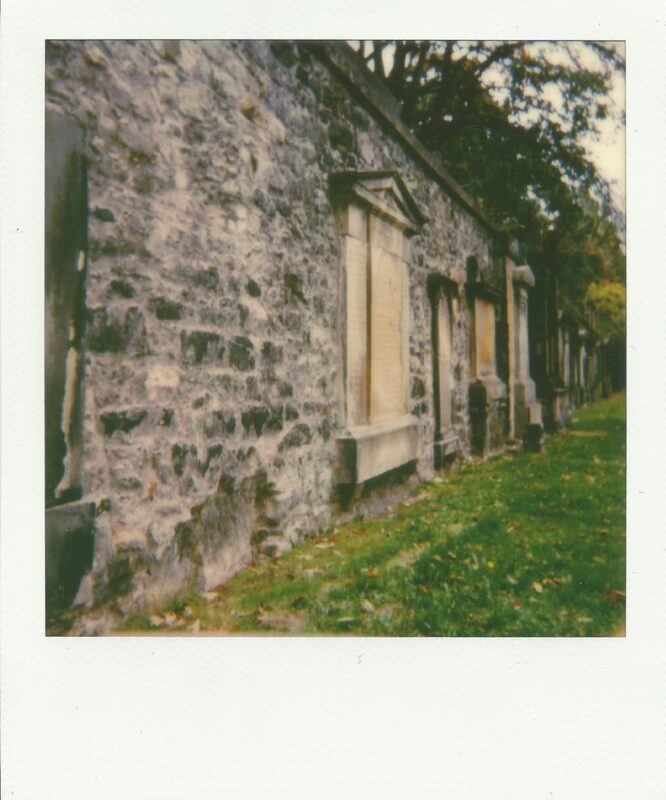 So…I shot this in a graveyard in Edinburgh as an experiment. I held a film box in front of the photo ejection slot while I took the pic. Extremely difficult to do hand held, so I balanced the camera on a handy gravestone. Anyway – look! Pretty much no streaks! Had I solved the problem? Unfortunately not. 🙁 St. Fillans church in Aberdour, shot today. Given how sunny it was, I once again took great care to keep the pics well away from light for ages after shooting, but still the annoying blue streaks appeared. I consider the photo more or less ruined by these. One more try, on the beach at Aberdour – despite being kept in very dark conditions when out the camera, it’s even worse. 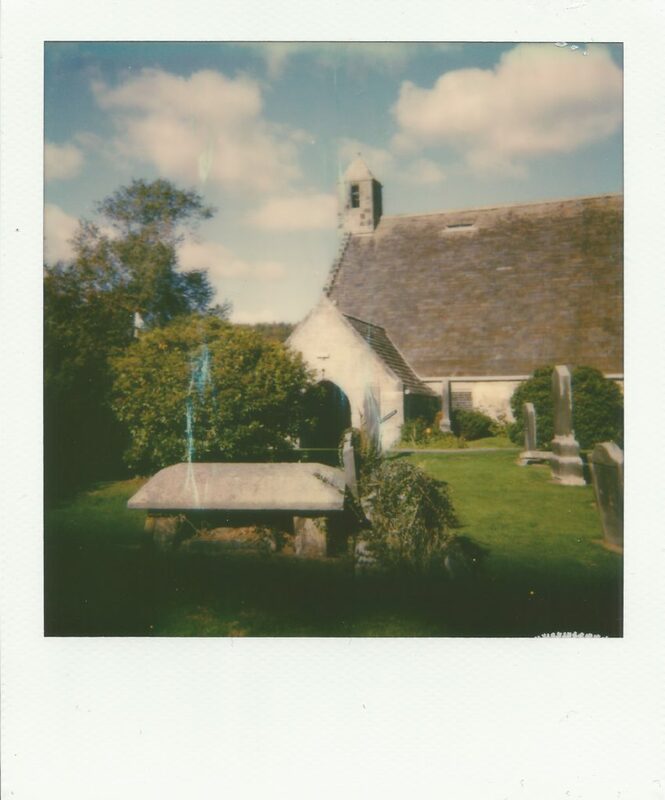 I find it enormously frustrating, because clearly a lot of people manage to do well with Polaroid Originals colour film, and don’t get the streaks – so why can’t I avoid them? Other people choose to find them charming, but I really don’t. At £17 a pack, making the photos close to £2 each, this film is really expensive and any failed shot is a lot of cash to waste. While spots and odd colours and other imperfections were always part of the Polaroid experience, they were never this bad. Although my camera is around 30 years old, I got hold of it recently in original packaging and almost mint condition – I’m not even sure it was ever used before I got it, it had the original guarantee card and instructions in it and everything. As a result, I’m reasonably sure it’s in good working order. I shot a long-expired film made before Polaroid’s 2008 shutdown last year, and although the colours were extremely washed out and the contrast non-existent, there were no streaks in it at all. This suggests to me that there’s a fundamental problem in Polaroid Originals’ product. It isn’t stable enough, it isn’t consistent enough, it’s too fragile and slow to develop, the failure rate is too high, and ultimately I don’t think the quality is good enough to justify the eye-watering price. It saddens me to have to write that – I really want to like Polaroid Originals. They’ve worked a miracle getting any film in production at all, as they had to recreate the product from scratch. I can understand some bumps and glitches on the way, but they’re selling something hugely expensive to people who have a right to expect consistency. Reconditioned 600-series cameras are being sold for £120! Considering they’re not much more sophisticated than a Box Brownie, and all the complex stuff is in the film, that seems way out of line, and is setting people up for a lot of disappointment. It’s especially ridiculous when you consider that Polaroid cameras were manufactured by the million, and are still extremely common. They show up all over the place. I paid £27 for mine on Shpock, and I think that was excessive. Most Polaroid cameras were like the inkjet printers of their day – simple loss-leaders that lock you in to buying consumables with a huge profit margin. For a lot less than anything with a Polaroid logo on it, you can buy a brand new, much more capable and sophisticated Fuji Instax camera. The pictures are smaller, but they develop quicker, they’re not damaged by exposure to light after ejection, the colour and contrast are better, the failure rate much lower, and the cameras offer quite a lot of choice and control. While Instax lacks some of Polaroid’s charm and classic design, at least it bloody works, and you’re buying a product with proper support and backup. Instax Mini photos, although small, are crisp and clear and scan nicely, and if you buy film in twin packs, the pictures are about 70p each. The black and white is a bit charmless and sterile, but the colour is lovely, and exactly what Polaroid should be aiming at (but seem unable to achieve). 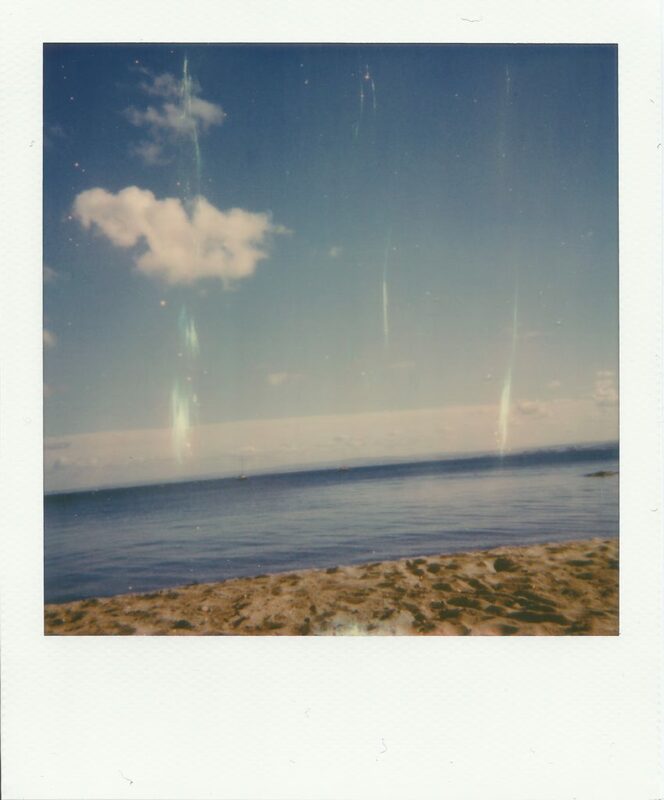 I suppose Polaroid appeals to the artistic and creative (i.e. hipster) market, and there seem to be plenty of satisfied customers, but it’s all a bit too like Lomography to me, a brand that has made toy camera photography insanely expensive. 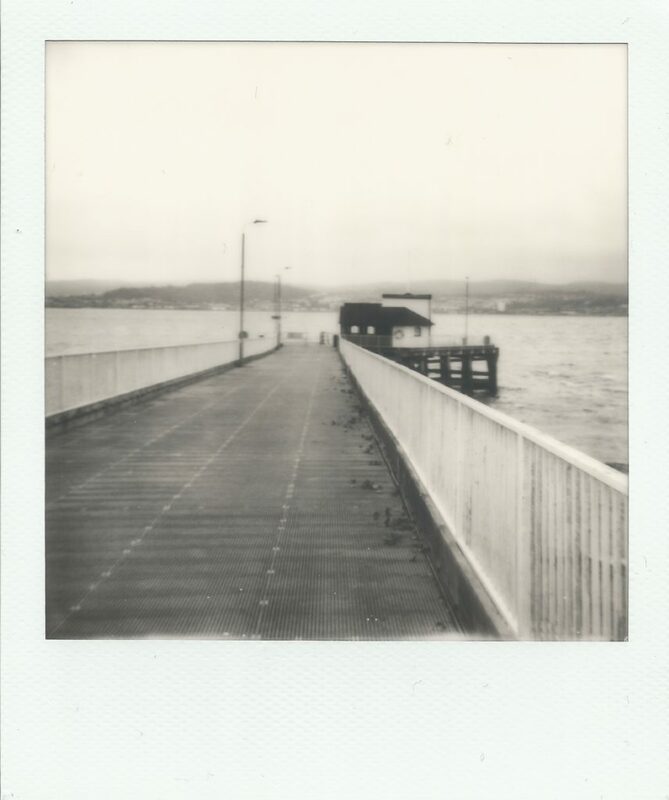 While I’ll happily shoot more of the black and white Polaroid film, the colour is just a waste as it stands right now. If you like square, technically imperfect, colour-shifted, vintage-style images, I’d suggest getting hold of a vintage Brownie, Holga or Diana camera, and load it up with a roll of expired colour slide film. Get it cross-processed, and you’ll get some lovely weird and wonderful results. You’ll have to wait a week or two to see them, which robs you of the novelty of instant images, but at least the majority of your shots will produce some sort of image – without the fecking blue streaks. It’s a shame about the issue with the colour film, but the black and white is gorgeous!